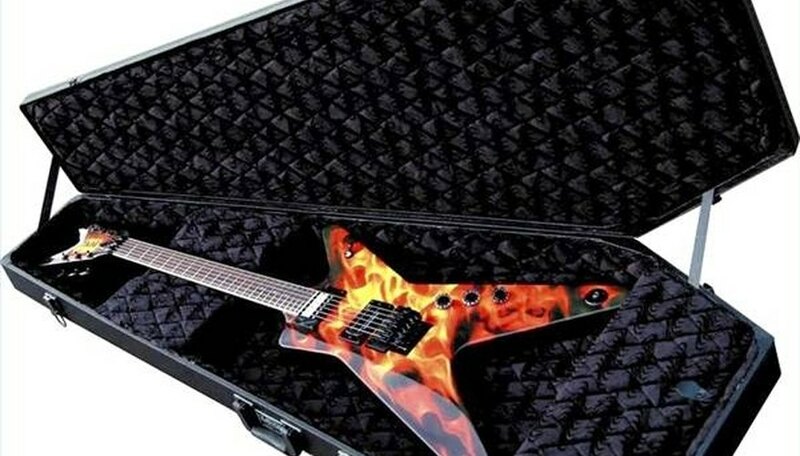 You don't have to be a follower of the Grateful Dead, Elvira or the Addams Family--- or a sucker for all things Gothic---to long for a guitar case that's a dead ringer for a funeral coffin. You do, however, need some basic carpentry skills to craft this special style of carrier so you don't impale your fingers and find yourself unable to hold a pick. You're sure to get plenty of envious glances wherever you go when you've completed this creative project and, as a bonus, you won't have to clip a luggage ID tag to the handle. Nobody will ever mistake your instrument case for his or hers. Create a pattern for the guitar and the lid by laying the instrument down on heavy brown wrapping paper and tracing your guitar to outline its dimensions. Use a T-square to pencil in the six-sided coffin-shape, adding about 1 inch around the guitar outline to accommodate interior padding. Make a second copy of the box layout in Step 1, but this time, add another inch all around to the measurements to create a pattern for the lid of your coffin case. Tape the templates to sheets of plywood; trace around the patterns, then use a jigsaw to cut out the top and bottom of the case. Figure in the guitar's height and add about 2 inches of extra room for padding. Cut six side pieces from the 1/4-inch plywood. Cut another six sections of plywood---no wider than 2 inches each and a bit longer to accommodate the overlap---to fashion the sides of the cover. All side pieces should be cut at a 90-degree angle so they abut each other properly. Sand, fit, trim and glue into place the six plywood side sections to shape the body of the coffin case. Allow to dry thoroughly, preferably overnight. Follow the same procedure for the top of the coffin case, but before you glue the side sections, check that the lid will close. Apply wood filler to close or seal small gaps, then sand the entire case. Glue into place a 1/2-inch plywood block to the interior of the case that spans the section to which the handle will attach. This wedge adds extra width so handle screws attach properly. Position and glue into place two small squares of 1/2-inch plywood to the exterior side section of the case to create a reinforcing block for the attachment of the case's handle. Brush on either a stain or primer, followed by paint, to completely cover the exterior of the case. Follow up either with at least two coats of glossy, matte or flat polyurethane finish to seal the guitar case. Use the original patterns made for the body and lid of the guitar case to cut sections of foam. Line the guitar case's interior and lid, but before gluing everything down, make certain the foam won't stop the case from closing. If it does, trim it down. Glue suitcase hinges and the latch to the body of the case. Securely fasten the handle using small screws with nuts and washers (preferred) or cement glue. To protect the bottom side of the case from scratches and scarring, glue a couple of small furniture leg protectors in place so when you set the coffin guitar case down on a hard surface, it rests on these pads. To keep things tidy in your guitar case coffin, install hook-and-loop strips to the interior of the lid to secure guitar picks and extra strings.